A beautifully designed pool is only as enjoyable as it’s construction quality. 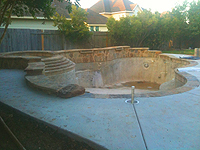 Cody Pools is consistently recognized for our superior swimming pool construction process. Even more impressive is our constant ability to construct a pool with a minimum of intrusions to our customers’ property, and their schedule. On average, our construction process can have you enjoying your pool in as little as 30-45 days. While other pool companies can leave you in frustration over the length of construction due to their available resources and overall quality, Cody Pools lets you enjoy your swimming pool quicker, and worry free. Below is a video that explains the design and construction process and a list outlining the systematic steps we take in creating your beautiful poolscape. One of our experienced and professional Designer Consultants will come to your house to meet with you. While there they will show you a variety of pool designs and help identify what you are looking from your pool. 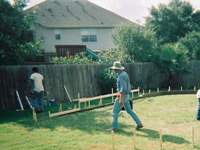 Measurements of the backyard are taken so that the designer can work on an accurate design. Every client receives a 3-D computer generated design before we begin construction. These incredibly realistic renderings allow you to see all the elements of your pool design as they integrate to your home and backyard. At this stage, you can make revisions and improvements as necessary. Upon approval of your design, we use this layout to create detailed engineering drawings and we begin the layout process. Once a design has been approved, your Design Consultant will meet with you at one of our Design Locations. Here you can see samples of tile, plaster, decking and stone and choose the ones that will work best with your pool. This next stage is the first in the construction of your Cody Pool. Here, we take the dimensions of the pool design & engineering drawings, and lay it out onto the proposed site area. This provides an ideal opportunity to see the outlines of the actual size and shape of the pool and make any changes to the size and location of the pool before we actually break ground with excavation. Once the layout stage is complete we then proceed on to the process of excavating the grass, underlying soil and rock in order to prepare the site for the pool construction. Just as steel and wood are used to form a solid foundation for a home; it is also used to form the shape and structure of your pool. While it is visually rough, it serves as the framework for a pool scape with high structural integrity. Before the gunite process, we install all the plumbing and electrical components. We ensure that the plumbing is pressure tested and the electrical meets the necessary city and state codes. Sure, invite your neighbors for a pool party when your pool is completed, but this stage is almost just as awesome. 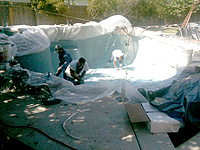 A large team of experienced personnel apply the gunite using high-pressure hoses to create the tough inner shell of your new pool. It truly is awesome to see the gunite concrete applied and worked onto the forming structure so that you get the first real time vision of your dream pool. Pool construction and design has a wonderful selection available of natural stone tiles, slates, ceramics, and mosaics. 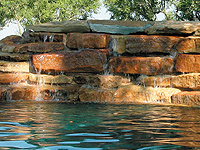 The pool coping can be crafted from natural stone, including limestone, brick, cement, or an assortment of other materials. Our masons have a tremendous amount of pride in their craft. Our superintendents take great measures to monitor quality control during the installation process to ensure that the work that is done is flawless and built to last. This is the perimeter area surrounding your pool. There are a variety of surfaces that are implemented here based on your design from the standard Sundek material to custom stone or stamped concrete. At this stage we also create any features included in your design such as outdoor fireplaces, firepits, fountains, summer kitchens and more. Applying the plaster is a complex yet easy process. It is blown onto the gunite and requires a quick, experienced and hard working crew to smooth the surface to assure a beautiful finish. The pool is then immediately filled with water. The next 7 days requires the homeowners to thoroughly “brush” the pool twice a day to ensure the smoothest surface possible. Since this step is essential and must be adhered to, please contact Cody Pools if you are unable to participate in this part of the process. Quite often a first time pool owner can feel overwhelmed by the initial start-up and maintenance of the pool. We provide every homeowner with the necessary training on how to use the controls of the pool equipment, plus a complimentary manual that explains in great detail how to easily care for your pool. In addition, our service dept. is available to answer any questions you have regarding the care of your pool and equipment. Receive a FREE copy of our pool planning guide that will answer your critical questions. You’ll find valuable information regarding choosing the right pool company and design, the construction process and more! Inspiration for your backyard oasis starts here! View our Pool Design Gallery of Freeform, Geometric, Negative Edge designs with spas, outdoor kitchens, water features and more. You’re dreaming it and we’re ready to make it happen. Schedule a no obligation in home consultation with one of our Design Pros. We’ll provide you with 3-D realistic design and a detailed estimate on your dream pool.